Knitted collars and other details. Knitted collar is an interesting and handy item that you can use during the upgrade. 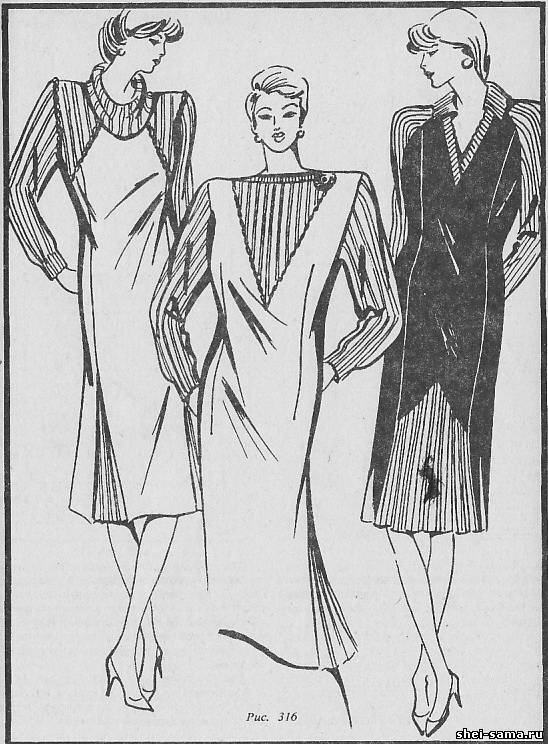 A variety of solutions offered by the fashion. Here is a description of some of the most practical and easy in execution models. Figure 312 presents the collar, made on the spokes of a viscous gum. It is characterized by elasticity, the ability to stretch and shrink. The most common variant of erasers - 1 X 1 (1 front, 1 purl), although there could be various other combinations: 2 X 2 (2 facial, 2 purl), 1 X 2 (1 front, 2 purl), etc. Detail of the collar is a straight band knitting width 16 cm, length of 60-70 cm On the treated pre-mouth shape of the caret impose a knitted item as shown in the figure, and namachivajut top planned lines of the long side of the part. Then the free ends of the parts superimposed on one another and namachivajut on the lower section of the neck. Sew the collar manually on top of the wkra seam behind the needle, grasping each loop. Of the same parts, made by rubber band technique, you can make a collar sewn into the angled neck (Fig. 313). Collars proposed in figures 312, 313 may be fastened to hinged loops. Loop vymazat crochet and sew to the edge of the part. Wooden buttons, made of leather, too, or crocheted from threads. The angled neck can be issued just bake, made with the same technique. In this case, the detail should be much narrower, with a width of 5-7 cm (Fig. 314). 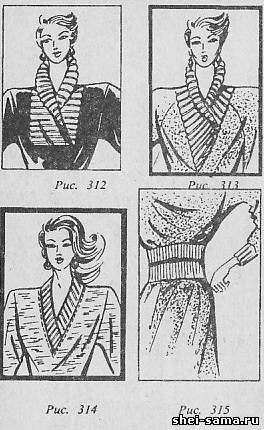 Knitted elastic band inserted between bodice and skirt, can significantly lengthen the dress and give it a nice tight shape (Fig, 315). The item is sewn one edge to the bodice, the other on the skirt and sew an elastic seam by hand (seam stitch back). The waist further accentuate the waist, made of leather, suede or made of the same thread (belt, cord). In the manufacture of knitted parts we must remember that before smachivanie should be done wet-heat treatment. Detail gently prick the pins (on the edges of details every 0.5 cm) in pattern with no tension. Then steam the item using a damp cloth hot iron without pressing, just lightly touching the surface of the fabric. Tarenna detail needs to lie down on the pattern. This will remove internal stress fibers and keep its size. Figure 316 shows the model in full figure dawasamu, made on the spokes. For their manufacturing it is possible to use a binding gum, etc. joints are decorated with braid or cord, made of the same thread. How to add length detail. If you want to add length edge knit or fine fabric, in the crook crochet knit loop and immediately gain it on the needle (Fig. 317). Nadesco do exactly on the edge of the elastic band - two loops facial, two, or purl one front, one back (Fig. 318). Thanks to its elasticity will pull it a little edge. It is very important to recruited the loop was smooth. The edge of the material for this purpose overcast. 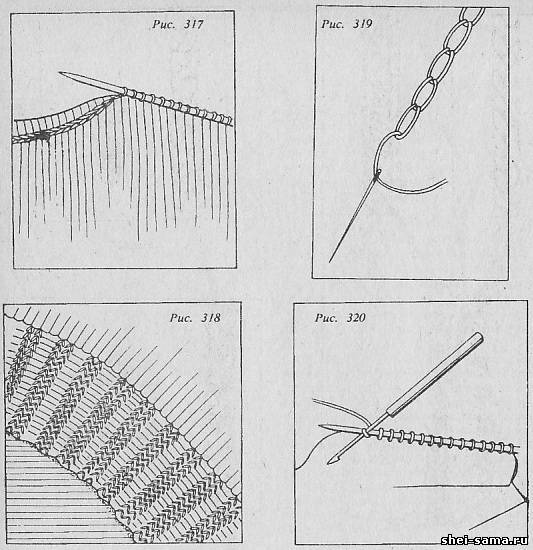 Tissue of great thickness make the first stitch of the chain (Fig. 319, 320) at a distance of 2 cm from the edge, and every single stitch promazyvayut loops. The size of the stitch should correspond to the thickness taken for nadasky thread.